Another of those incredible experiences in Lapland, one we all loved but it nearly didn’t happen. Scheduled to take place early in the week, the temperature at -30 degrees centigrade was deemed by the experts to be dangerously low. Unwilling to risk frostbite we resigned ourselves to missing out, however when the weather warmed up to a balmy -18 degrees centigrade the husky ride was back on. A mere fifteen minute drive from Levi and we were at husky headquarters. Like most of the experiences here this was far from cheap but it is unmissable. We were met at our coach by the lady who operates the kennels and is the proud owner of 95 racing huskies. All are trained to follow a 6 mile trail through the forest and across a lake. No prior experience required, we were shown the basics of driving a husky sled – as easy as riding a bike they claimed – while demonstrating how to stand, balance and steer. Layered up we were almost ready to go. Multiple thermals and outer layers are essential. You also need to cover every bit of exposed skin on your face before you get going, this makes it a more pleasurable experience. The temperature as you travel through the forest and over the lake is like nothing I’d ever experienced before. Ski goggles were an optional extra but one we were very glad to have. In the Arctic regions they have used sled dogs for hundreds of years as a means of transportation in the frozen wilderness. At these kennels they use Siberian and Alaskian huskies. My first thought as we approached the dogs and sled area was that these were creatures possessed. Barking hysterically, literally bouncing up and down in the snow and straining to get going, it was just incredible. 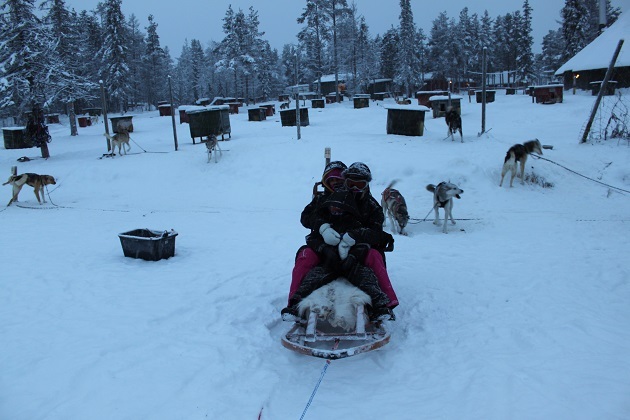 Six dogs were attached to our sled, Husband took up the driving position and Son and I huddled on a reindeer skin on the sled. All of a sudden we were off. The dogs shot ahead, straining all the time to go faster still. This is the most wonderful experience – a mixture of an adrenaline rush and so exhilarating but at the same time so incredibly tranquil as you glide across the glistening, sparkling snow. Everywhere is white and silent, it feels like you are in a world all of your own. A guide on a snowmobile kept an eye on everyone making sure all was as it should be – the dogs know what to do however. There was a stop at the halfway point to change drivers if you so wished. We stayed as we were. Our husky team worked hard but apparently did not travel as fast as normal. Fresh snow had been falling all morning, apparently this slows them down as it is harder for the dogs in these conditions to build up speed. The husky safari lasted about an hour. Afterwards we were taken back to a traditional kota with a blazing fire in the centre. Hot drinks and sausages cooked over the open fire was the perfect way to warm up. Right at the end we had fifteen minutes to wander around the kennels and meet the dogs. Imagine our excitement when we got to hold a two month old cute and cuddly husky puppy. The perfect end to an incredible afternoon. Soooo cold – your eyelashes freeze and I’ve never experienced that before!! Did you get to shout Mush, Mush? My friend’s dad used to have a Hillman Husky van and he used to drive us to Boy Scouts in it, does that count? That definitely counts!! We didn’t should anything – mouths firmly shut in case our saliva froze!! Just spotted that dog far left – is it taking a pee? Maybe or maybe something more – they are remarkably adept at doing that as they run – fascinating!!! That is a real skill! I know – well impressed…. It was another of those unforgettable Lapland experiences, so much fun and so different. The puppy was so cute – we wanted to keep him!! I know, so cuddly and gorgeous. It’s loads of fun Suzanne, you should try it!! Wow that’s amazing! I’ve always wanted to try it, even though it may be freezing! Definitely freezing but when you’re doing this you somehow don’t notice the cold it is so much fun. Thanks for sharing an experience I will likely never have. It is such a fun thing to do, don’t know if we’ll get the chance to do it again either but we loved this chance. Awesome memories again. Does son want a puppy now? I find I edit my snow pictures using filters to counter the blue light at this time of year. You have a nice following who add comments, congratulations. You could do a multi post about travel memories from 2015. We saw huskies in Alaska but no chance to participate. For years I saved a link to a place you could do it in Scotland and the forgot all about it. I’ve just checked and it’s still there (Cairngorm) – hmm, maybe…..
I’ve just googled that too Anabel – Aviemore?? Very interesting, something to think about for us too!! God, that’s cold..:( but those dogs are beautiful. So cold George although it’s such a great experience once you get going you don’t notice. The dogs are gorgeous and that puppy just stole all our hearts. Would do everything to have a go in a husky sled! It’s fantastic – the best experience!! You should try it sometime!! Been enjoying your NZ posts – sounds like it might be a bit of a struggle with those temperatures though, what a difference!! We all fell in love with him!! Another exciting experience, a few days here in Toronto have been -15 but I can still feel the cold you explain of where you are…keep warm! This was so cold, colder than anything I’ve ever felt before but we loved it. Aww the husky puppy is adorable Joy! 🙂 Another amazing experience by the looks of it – the scenery is so beautiful and the ride with the dogs must have been wonderful! Am glad it warmed up to -18!! Can’t fathom being out in such cold – thank goodness you had all those layers on plus the ski goggles! It is so weird Rosemary, when it was closer to minus 30 that was almost unbearable, when it got up to minus 18 it felt really quite pleasant!! 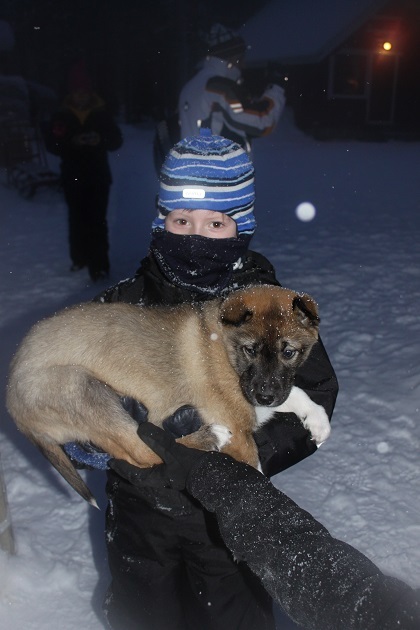 We loved the husky puppy – didn’t want to leave him behind!! It’s amazing how the body adapts to temperature changes Joy! We need a jacket or cardi when it gets down to the low 20s in the summer as we’re so used to much higher temperatures in the mid to high 30s (and occasionally hotter). That’s why I freeze when we come over to the UK (usually April time)! I would have loved to have taken that puppy home with me too!! You definitely need layers – and plenty of them, but it is such a fun and thrilling thing to do – highly recommended! That was a two-month old husky pup? It was almost as big as your son! He was pretty huge, not sure how big he would be now – wolf like!! It was loads of fun, we loved every second of this and would really love to do it again sometime. It was such a different and unusual experience for us, we loved every second and then with the puppy at the end… it doesn’t get better than that!! One of the most fun ways to travel that’s for sure Denzil – best wishes to you too for the new year. Joy, what a great-sounding experience! I can’t imagine that severe cold, but apparently worth braving the temps for the wonderful ride! Your son will have a bank of memories! 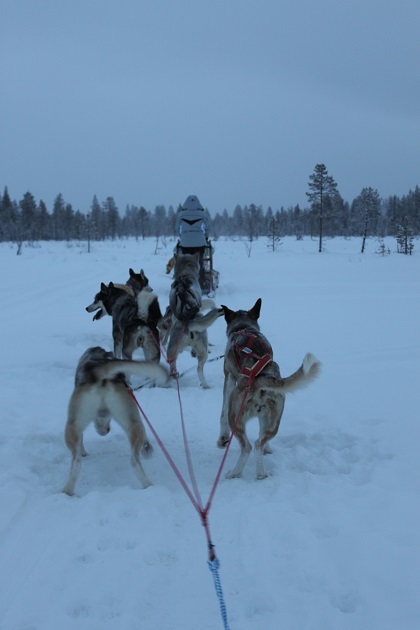 Definitely worth it Pam, this was one of our (many) Lapland highlights – being pulled by a team of huskies is not something you get to do very often!! I’m so jealous! 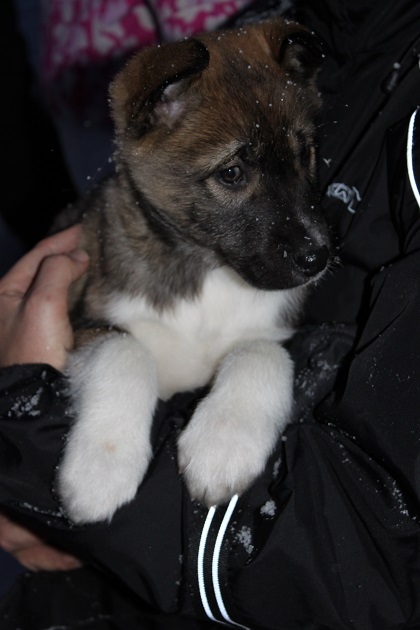 I’ve always really really wanted to go dog sledding, and oh my god, that puppy! Adorable! I will definitely have to make it to Lapland one of these days! It was such a great experience, we all had the best time that afternoon – would love to do it again now, that’s the only problem!! 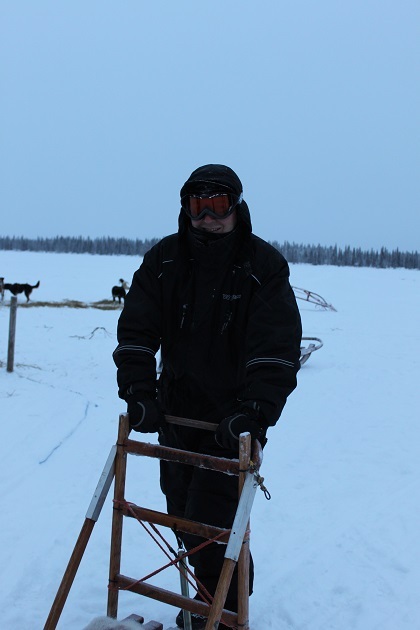 The Husky sled was definitively the best experience I had in Lapland. It looks like you had a great time ! Absolutely loved this – anything with dogs and we’re in!! It’s such a lot of fun – a really great experience. We did a reindeer safari on a previous trip and loved that too – very different to a husky ride but equally lots of fun and really memorable. It seems that I have missed this wonderful post. Thank You presenting Lapland. Happy Sunday. Thank you for commenting and reading! We love Lapland, another of those places I could never get enough of!! Hope your weekend is wonderful too.